Many people will have had a meal out wrecked by an unruly child at a nearby table, but parents should not let the fear of embarrassment put them off the idea of a meal at a restaurant. Having children does not have to mean eating at home all of the time. In fact, the sooner parents introduce a child to eating out the better. After a few visits, young children will be more comfortable with the whole restaurant experience and with what is expected of them. Before long, parents will be rewarded with a well-behaved dining partner. Obviously parents have to be willing to alter their expectations too. Meals out will be a bit noisier and messier now, but, with a little forward planning, eating out as a family should still be an enjoyable experience. Do They Have a Children’s Menu? A stay-at-home dad should take some time to choose an appropriate restaurant. Try to pick one that is genuinely family-friendly rather than just child tolerant. Ask if there is a children’s menu and ensure that a highchair or booster chair will be provided. Some restaurants will even offer children games or crayons to keep them amused while they wait for food to be served. Young children are not very patient, so a long, leisurely meal is not a good idea. Try to avoid peak meal times, when it will take longer to be served, and if the adults order starters ask the waiter or waitress to serve the child’s meal at the same time. Children should be allowed to order their own meal when old enough to do so, but parents should recommend dished the child is known to like. Of course, it is good to encourage children to try new foods, but do this at home instead, as it can be expensive finding out in a restaurant that a child is not too keen on scallops. Buffets are a favourite with many families, as the wide choice of food available should cater for the tastes of every family member, and children can try different foods without wasting a lot. The best way to ensure a child is well behaved in a restaurant is to encourage and expect the same levels of good behaviour at home. Try to have family meals together, sitting down at a table rather than on the settee in front of the television. 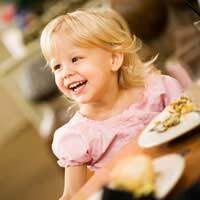 Teach children good table manners and engage them in dinner conversations. A househusband should do what he can to make the dining out experience an enjoyable one for the child. Take a couple of small toys that will keep the child amused during the wait to be served, but nothing that will annoy fellow diners by flashing and bleeping. If the child had a favourite drinking cup, take it to the restaurant. Try to keep children entertained and focused on what is happening at their own table and that way they are less likely to bother other diners. Be reasonable with expectations. It is not important that children are silent, but encourage them to talk and laugh rather than shout and scream. In time, children can be allowed to choose the restaurant once in a while, as involvement in the decision-making process will help make them feel , and therefore behave, more grown up. Soon parents will be so confident in their child's behaviour that a weekend break or holiday will seem far less daunting.